Come to our SOCK HOP - Wednesday, April 24 at the library and dance jump and hop on our new COLOR BURST PLAY MATS! Wednesday, April 24th the Color Burst Play Mats are BACK! A Sock Hop is being held again at the library! Wear your favorite socks, make plans with your friends and family to have some fun, and come to the library on Wednesday, April 24th around 11:00am (after 10:30am Chalk Art Story Time). What are Color Burst Play Mats? Interactive mats that respond to movement and pressure with bright gel liquid colors that move with every step, skip, jump, hop or hand movement! Color Burst Play Mats made their library debut on Wednesday, February 27th. 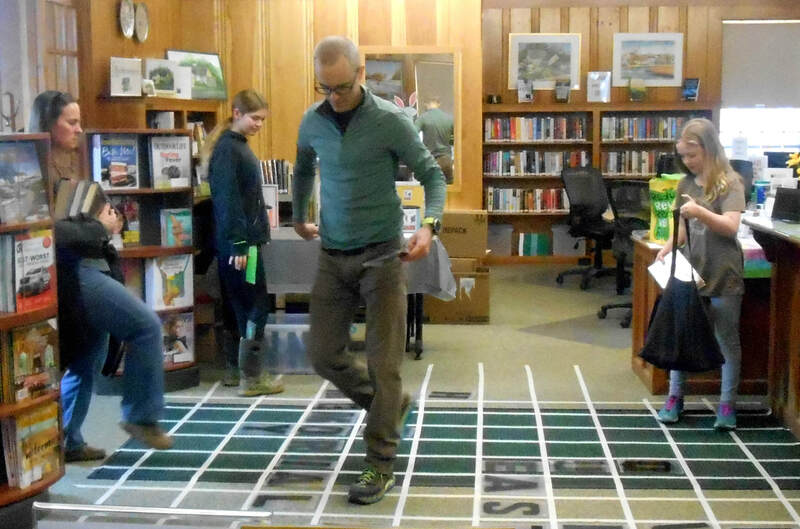 We held “sock hops” at 10:30 a.m. and 2:30 p.m. Lots of kids of all ages jumped, danced and hopped to music\- moving from one color tile to another. It was a fun time for all. Beginners - Cake Decorating Class , Tuesday, April 30 from 4 - 6pm. In Celebration of Cinco de Mayo the library will have Choco Tacos, Monday, May 6 from 3pm to 6pm for those that stop in the library. Make sure to mark your calendars and come in for some yummy fun! The Chesley Memorial Library Board of Trustees will meet at the library on Friday, May 10, at 10:15 a.m. The Friends of the Northwood Library will meet at the library on Monday, April 22, at 6:45 p.m.
​Would you like to join the Friends of the Northwood Libraries? By joining, you are showing the community that you feel the library is an important institution in the Northwood community. You can help support the libraries by participating in fundraising activities and volunteering your services. The Friends support, improve, and promote the Chesley Memorial Library. Available for use anytime the library is open, ask a Librarian to get them for you. Have you used the Power Construction Magformer Set yet? We can pull out the Magformers, LEGOs, and Brainflakes whenever you want them, so just ask any staff member for a set when you are looking for some creative play time. Research scientist Dorothy Singer suggests that “promoting play contributes to early literacy development by increasing attention span, memory, creativity, and language and vocabulary skills. It also lays the foundation for logical mathematical thinking, scientific reasoning, and problem solving.” We can leave your creations on display until the next session so bring your family and friends back to see your masterpieces! Just ask us to bring them out if you'd like to play with them this year. HeritageQuest Online is also available for our patrons to use at home and in the library. The Afternoon Book Discussion Group will meet at the Chesley Memorial Library on Wednesday, May 1, at 2:00 p.m. to discuss “King Peggy" by Peggielene Bartels and Elanor Herman. ​From Amazon: "The charming real-life fairy tale of an American secretary who discovers she has been chosen king of an impoverished fishing village on the west coast of Africa. King Peggy chronicles the astonishing journey of American secretary, Peggielene Bartels, who suddenly finds herself king to a town of 7,000 people on Ghana's central coast, half a world away. Upon arriving for her crowning ceremony in beautiful Otuam, she discovers the dire reality: there's no running water, no doctor, no high school, and many of the village elders are stealing the town's funds. To make matters worse, her uncle (the late king) sits in a morgue awaiting a proper funeral in the royal palace, which is in ruins. Peggy's first two years as king of Otuam unfold in a way that is stranger than fiction. In the end, a deeply traditional African town is uplifted by the ambitions of its decidedly modern female king, and Peggy is herself transformed, from an ordinary secretary to the heart and hope of her community." The Evening Book Discussion Group will meet on Wednesday, April 24, at Blaisdell Memorial Library in Nottingham at 7:00pm to discuss "The Story of Arthur Truluv" by Elizabeth Berg. From Amazon: “For the past six months, Arthur Moses’s days have looked the same: He tends to his rose garden and to Gordon, his cat, then rides the bus to the cemetery to visit his beloved late wife for lunch. The last thing Arthur would imagine is for one unlikely encounter to utterly transform his life. Eighteen-year-old Maddy Harris is an introspective girl who visits the cemetery to escape the other kids at school. One afternoon she joins Arthur—a gesture that begins a surprising friendship between two lonely souls. Moved by Arthur’s kindness and devotion, Maddy gives him the nickname “Truluv.” As Arthur’s neighbor Lucille moves into their orbit, the unlikely trio band together and, through heartache and hardships, help one another rediscover their own potential to start anew." ​​Books that we have read for our evening book group over the last 10 years are listed on Pinterest! M﻿﻿onday'﻿﻿s﻿﻿ are﻿﻿ Senior Cafe Day at﻿ ﻿Chesley Memorial Library all year long! Look forward to spring with your friends and neighbors at the senior café! Chesley Memorial Library Senior Café meets every Monday from 1:00-2:30 p.m. unless we are closed to observe a holiday. ​Come on in for a chance to chat, enjoy a cup of coffee or tea, and sample some delicious goodies while you visit. Caretakers are welcome to stay with seniors for the café but can also enjoy some time away on their own if appropriate. Please call the library at 942-5472 if you would like more information. Vote for your favorite books at the library in April! 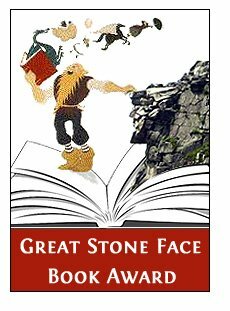 The Flume Award, Great Stone Face Award, and Isinglass Awards are being voted on this month for books in their respective age groups. Stop in the library and have the kids vote for their favorite nominees! 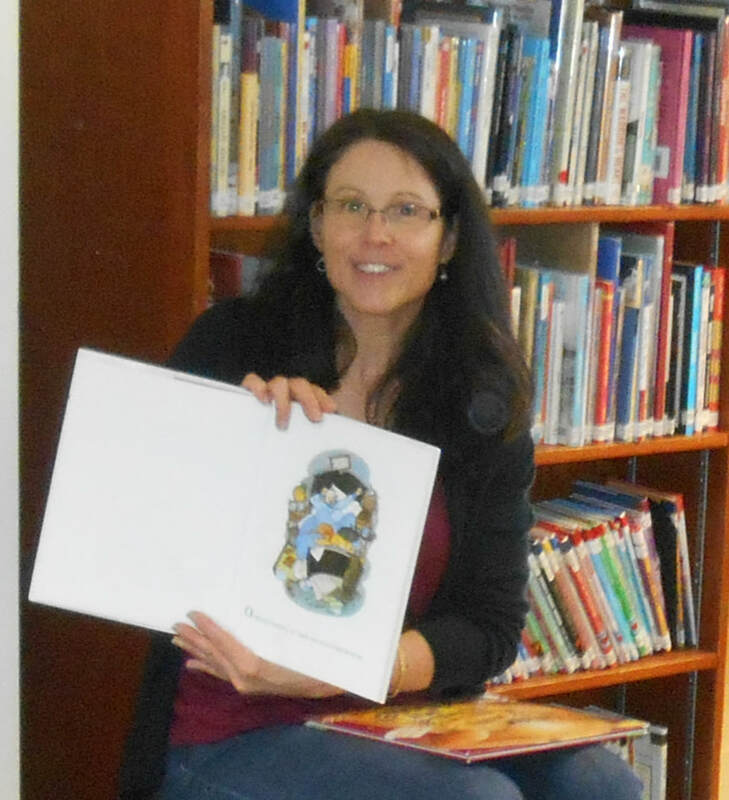 Story Time for preschoolers of all ages takes place on Wednesday mornings at 10:30 a.m. If you have not been attending Story Time, you might want to stop in and check out the program. Children can listen to a story and make a craft to take home. On Thursday, April 18 and Saturday April 20, kids came to make an adorable stand-up Easter Bunny. Materials and directions were available while supplies last. The children enjoyed making them and decorating them.Thank you to all who came out and participated in this. We had some creative rabbits made here. We hope you all had a Happy Easter and enjoyed the day. Nation Scrabble Day was Saturday April 13th - WORDS were the challenge of the day! 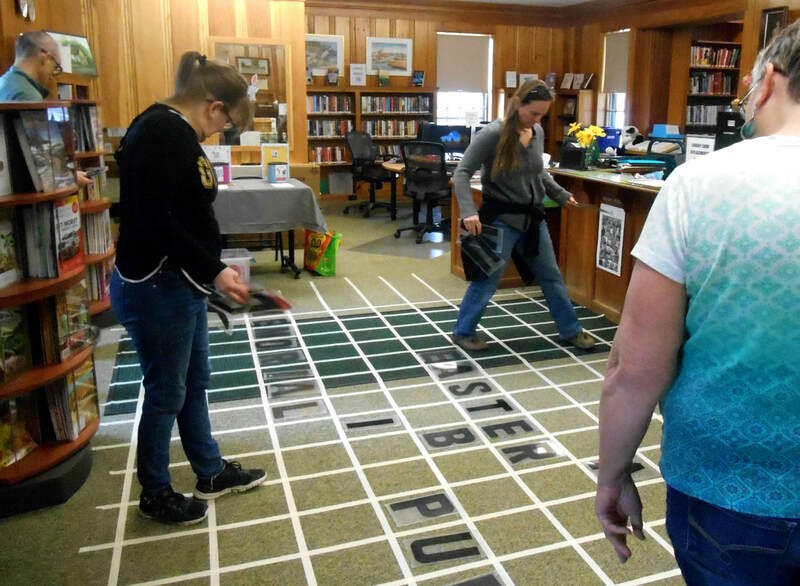 The library created a floor sized scrabble board where everyone could have some fun. From the National Day Calendar website: "National Scrabble Day is observed annually on April 13th. Originally named Lexiko and then Criss-Cross Words, Alfred Mosher Butts eventually settled on the name Scrabble. The amateur artist and unemployed architect developed the word game in the midst of the depression. Still, it wasn't until 1948, a final name change and a trademark that Butts finally began to produce the game. Scrabble is played with two to four players who score points by forming words from individual lettered tiles on a game board marked with a 15 x 15 grid. In the United States, the name Scrabble is a trademark of Hasbro, Inc. Scrabble is sold in 121 countries with 29 different language versions. Worldwide, over one hundred and fifty million sets have been sold with sets being found i nearly one-third of American homes." Homemade, library-baked donuts were available while supplies lasted on Saturday, April 6. The Library also received a generous donation of 3 dozen assorted Apple Cider Donuts from the Chichester Country Store. We had a wonderful turn out from the community to help us try all these donuts! The library has decided to hold a monthly Donut Day to continue to offer the community a time and place to get together, use our facilities, and check out everything the library has to offer. Keep watching our website for information on our next Donut Day! Thanks again to Chichester Country Store for the delicious donuts! “End 68 Hours of Hunger” is a private, not-for-profit, effort to confront the approximately 68 hours of hunger that some school children experience between the free lunch they receive in school on Friday afternoon and the free breakfast they receive in school on Monday morning. Drop off your donations in the box at the library. Suggested items to donate: granola bars, individual snacks, soup, oatmeal packets, etc. Visit their web site for more information: www.end68hoursofhunger.org. HOW CAN I READ 1000 BOOKS? It’s easy! One book a day for three years=1000; three books a day for one year=1000; ten books a week for two years=1000. WHERE CAN I SIGN UP? Sign up at the Chesley Memorial Library. We will give you sheets to help you keep count of the books you read. You will receive a book bag when you sign up and will continue to earn incentives as you read your way to 1000 books. WHEN: Today! Register anytime when your child is between birth and five years old. IMPORTANT: Please update your progress at the circulation desk every time you read 100 books! We keep track in a log at the library and update our milestone wall display in the youth area. 1000 book readers will be recognized with their name on the library’s sign and will be invited to attend a special ceremony at the Northwood School next August with recognition from the library staff and trustees, Northwood school teachers and personnel, and Northwood School Board. Don’t forget to plan a trip to one of the museums in Boston! The Chesley Memorial Library has passes to the Boston Museum of Science, the Boston Children’s Museum, and the Boston Museum of Fine Arts thanks to help from the Friends of the Northwood Libraries. Each pass works a little differently so call us at 942-5472 for updated information regarding passes. Yes, we are a free WiFi spot. The public WiFi is always on for your convenience. We've gone social! Check us out on Facebook and Twitter. Libby/OverDrive (The New Hampshire Downloadable Books Consortium) requires a PIN number to access your account. Your PIN number is the last four digits of your primary phone number. Our book return is emptied prior to opening daily. be checked in the next business day. There's more than books at Chesley Memorial, Northwood's Public Library, we carry a wide range of magazines (Read them while at the library or take them home to enjoy at your leisure). Header Image used with permission, covered under all copyright laws.